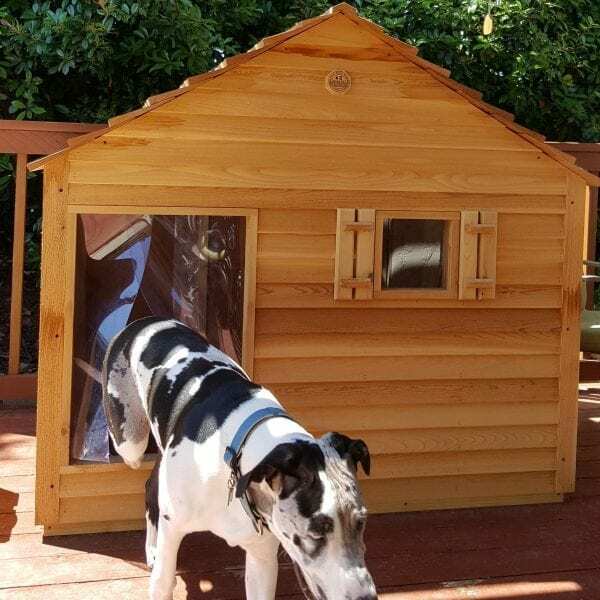 This house is specifically designed for tall breeds, such as the Great Dane, Bull Mastiff, Saint Bernard, Afghan, and other especially tall dogs. The huge door is elevated off the floor nearly six inches to make the entrance more accommodating for these large dogs, and the house comes with a stationary, real glass window and shutters. Blythe Wood Works designed this house for the Great Dane breed because there were no houses available that were large enough to accommodate them twenty-five years ago! Soon after we introduced it in the market place we quickly learned that it fit many other tall, large breeds such as Bull Mastiffs, Saint Bernards, Afghans, and many more. The huge door is elevated off the floor nearly six inches to make the entrance more accommodating for the taller breeds. This house also comes with a stationary, real glass window and shutters. The Giant House is a beautiful dog house which consists of seven predrilled, easy to assemble panels. The house comes standard with a heavy duty vinyl flap door installed. Use our sizing guide to find the perfect size dog house for your pet. You can also reference our Dog House Sizes by Breed page.